Pixelmator Photo is a photo editor unlike any other. It features a collection of nondestructive, desktop-class color adjustments. A set of gorgeous presets inspired by analog photography. A magical Repair tool to remove unwanted objects. Full support for editing RAW images. Artificial intelligence that automatically improves photos like a pro photographer. And it's designed exclusively for iPad, bringing the most native and intuitive editing experience imaginable. • Edit photos using a collection of advanced, nondestructive color adjustments, specially designed to preserve detail and naturally improve photos. • Take advantage of full RAW support to edit high-resolution RAW photos from your DSLR camera or iPhone. • Effortlessly remove unwanted objects using the incredible Repair tool. • Crop, straighten, and correct perspective with an easy-to-use Crop tool. • Use groundbreaking machine learning to automatically enhance photos, adjust lighting, white balance, and colors, apply presets, and even improve the composition of your photos. • Edit completely nondestructively, resetting changes made with any tool at any time you like without affecting other edits. 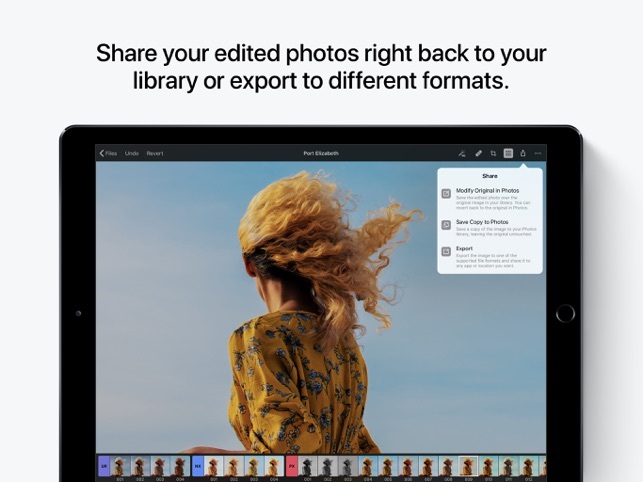 • Share edited photos back to your Photos library, export to a range of different formats, and easily share photos with others. • Edit photos using a collection of powerful, desktop-class color adjustments. • Follow all the changes you make in the beautiful live histogram. • Improve exposure, contrast, brightness, highlights, and shadows using the Lightness adjustment. • Adjust color saturation, vibrance, and hue with Hue & Saturation. • Improve the balance of colors in the shadows, midtones, and highlights. • Selectively adjust individual color ranges using the Selecti​ve Color adjustments. • Quickly improve brightness, contrast, and color by setting black, white, and grey points using the Levels adjustment. • Use the Curves adjustment to adjust lighting and color with incredible precision. • Mix the balance of the red, green, and blue color channels to create intense color effects in your images. • Replace any color with any other using the Replace Color adjustment. • Create beautiful black and whites even from your color photos. • Use the Fade adjustment to wash out the contrasts in your photo and give it a faded look. • Add beautiful, film-style grain with the Grain adjustment. • Use a range of additional adjustments, like Sharpen, Color Monochrome, Sepia, and Invert to make any photo stand out. • Use ML Enhance, trained on 20 million professional photos, to improve your photos like a pro photographer. 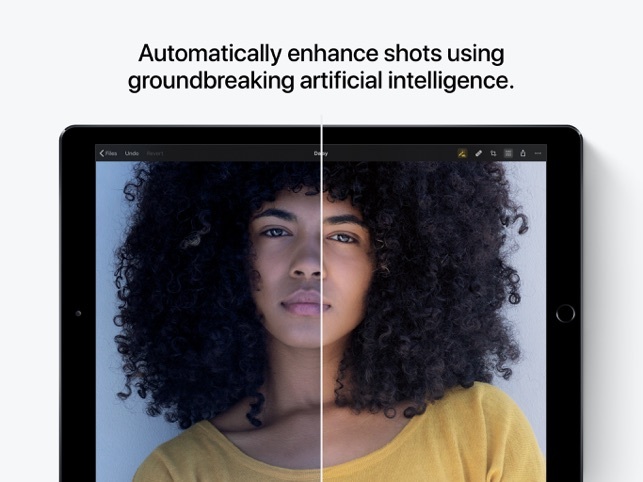 • ML Enhance automatically takes care of all the subtle improvements that go into every great shot — white balance, exposure, shadow, and highlight detail — so you can focus on adding your own creative finishing touches. • Automatically fine-tune individual adjustments, like Lightness, White Balance, Selective Color, and Color Balance using the knowledge from the same 20-million-photo Core ML algorithm. 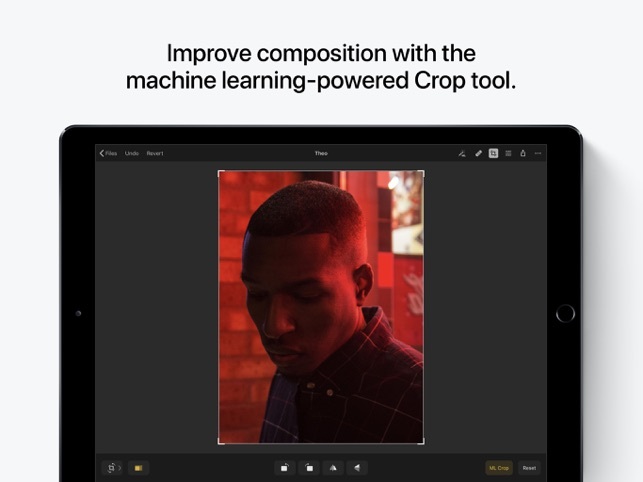 • Intelligently crop photos using the machine learning-powered ML Crop. • Pixelmator Photo includes extensive collections of presets inspired by different photography styles and designed for a variety of subjects. • Create and save your own custom presets. • The Black & White presets are based on classic black & white analog films for creating authentic monochrome shots. • The Cinematic presets emulate the orange and teal look, letting you quickly add striking color contrasts. 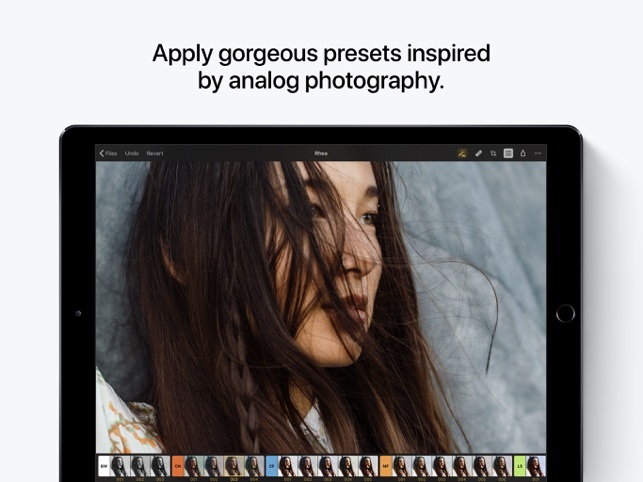 • The Classic Films and Modern Films preset groups are based on some of the best-known and popular analog films from the past and present, creating subtle and tasteful analog photography looks. • Use presets in the Landscape, Urban, and Night collections to quickly enhance your nature photos, city photography, and night shots. This update improves memory management, especially on the iPad mini 5 and iPad Air 3, fixing a number of related crashes and brings several additional improvements and fixes. • Improved memory management for issues caused by opening photos that need close to the maximum memory allocated by iOS. This fixes a number of related crashes. • Events and People albums synced from macOS via iTunes will now appear in the photo browser. • Albums synced from macOS will now be sorted alphabetically. • Photos synced from macOS that aren’t in any album will now be available in All Photos. • When syncing via iTunes, Pixelmator Photo documents will now appear in File Sharing. • Fixed a number of cases where the Modify Original in Photos option in the Share menu would be enabled when it shouldn’t. • Modify Original in Photos should now work even after deleting and reinstalling Pixelmator Photo. • In some situations, rotating the screen while using the Crop tool would misplace the cropping handles. Fixed. • Selecting the None crop preset would cause Pixelmator Photo to stop responding. Fixed. Have any feedback about this update or Pixelmator Photo in general? We’d love to hear it at support@pixelmator.com! On first launch tried to open a photo from iCloud Drive nothing happened. Deleted the app after a few minutes and reinstalled and still no images are importing... I’m on the newest iPad Pro so not sure what’s going on with the app but I really want to like but I can’t even test it out. Edit: Leaving my original comment just so people are aware of what happened. Now that my images started loading I am enjoying this app. All edits seem to be nondestructive which is extremely useful and especially for a mobile app. Every adjustment seems to me its own layer now you do not get layer controls but its essential there just behind the scenes. Having the ability to toggle adjust notes on a off its very useful. I also like that the presets show their settings which lets you add some more granular control Incase you wanted a specific look for a photo but like the colors from the preset. And also custom presets are amazing! I’m glad that made it in here seems like Pixelmator is beating adobe to it in the mobile app game. Excited to see future development of this app! 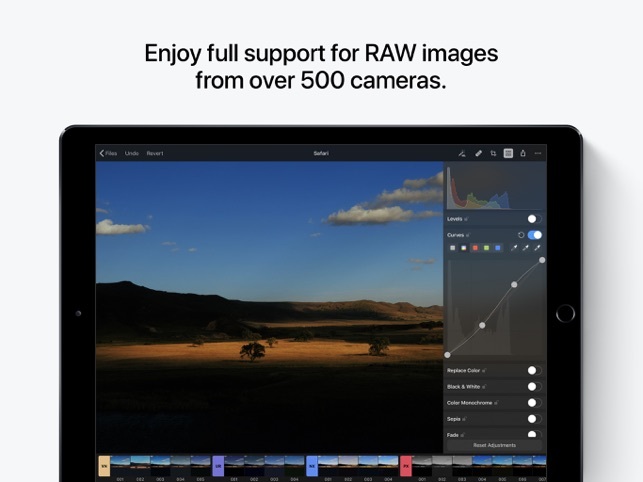 For everyone waiting and waiting and waiting for the definitive iPad-based RAW photo editor, this is it. The app is beautifully designed and intuitive for a former Lightroom desktop user. I had high hopes for Snapseed, but their RAW support hasn’t added new cameras in more than two years. Pixelmator Photo, drawing off iOS RAW support, will always be up to date. There are still a few more editing features I’d like, such as a brush softener (maybe it’s there already? ), but I can already tell that my RAW workflow is now going to run straight from import to this app. 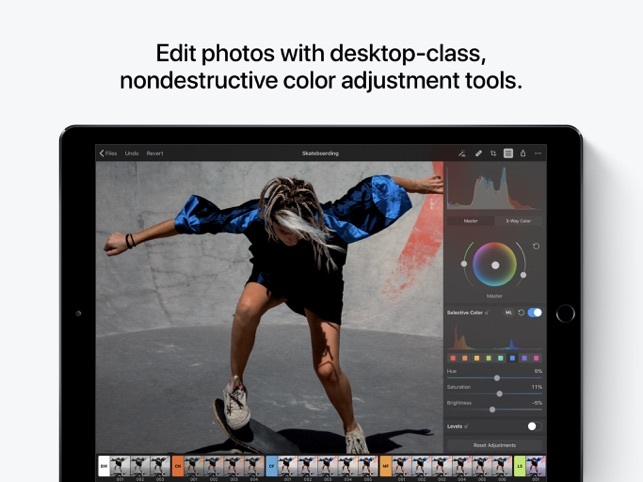 Frankly, I would have paid $20 for this app, had I known for sure it was going end my search for an iPad-based RAW editor - there’s that much value here. This app, coupled with the iPad Pro photographer-friendly hardware features, renders the iPad fully capable as a desktop alternate for serious photography hobbyists and plenty of pros. This company also has incredible support. I e-mailed about an issue at midnight on launch day, and I had a response and full resolution by 6am the next day. lowkey wish i bought that second cheeseburger on friday instead of preordering. I realize now I thought that this was supposed to be a “pixelmator pro” ... but it says photo. My mistake as I was expecting some more affinity photo-like capabilities. Love pixelmators ease of use and was hoping they brought that to us, but no. All this app does is change colors and fix blemishes. 100% pointless if you own pixelmator or affinity photo or darkroom or lightroom which is better and free or pretty much any other editing app. Sorry pixelmator team but really wish i didn’t preorder this. Nice UI though. Could be worth it if we could batch edit photos easily with the “groundbreaking ai” they claim to have. Easy to use selection making, abundant of interesting effects for photos so i can delete the multiple apps i have that do some effects. Just some other reason to use this app over others as currently there’s no unique function, let alone a mobile version. *Edit* If we can use all the features of the app within the stock photos app this would be a fantastic addition and would make sense to the pixelmator line-up. 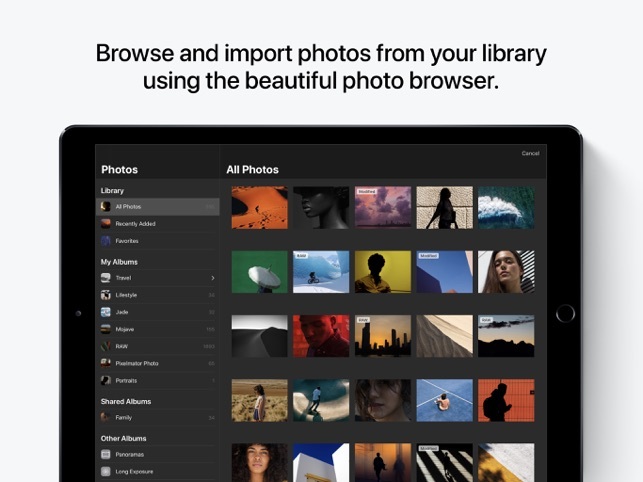 You're quite right — this isn't Pixelmator Pro for iPad so just in case anyone is wondering how this app is different and what it does, let me explain. Pixelmator Photo has a much more extensive collection of color adjustment tools compared to Pixelmator for iOS. If you only focus on editing brightness/saturation/contrast in photos, you don't necessarily need Pixelmator Photo. If you want to dive deeper into photo editing to do things like adjust specific color ranges of photos, fine-tune shadows and highlights, create your own presets, basically really make photos shine, Pixelmator Photo lets you do that. It also has a Core ML-powered auto-enhance feature that improves photo automatically, showing you all the changes it makes in each adjustment. So even if you're a beginner interested in these things, you can get some great results and learn more about photo editing. Pixelmator Photo is completely nondestructive, so you can make changes with any tools and reset them/fine-tune them individually at any time. This style of workflow gives you a lot of freedom for photo editing. What's more, this 1.0. You can expect a whole bunch of updates and improvements in the future that will make this app even better. Pixelmator for iOS is a layer-based image editor, with tools that make it great at a lot of different things — creating designs, compositing different images, editing photos, and more. Pixelmator Photo is a photo editor with tools that make it *especially* great at one specific thing — editing photos. Finally, we'd love to add everything as an extension to the Photos app but our Repair tool alone requires more memory than is available to extensions so this isn't technically possible right now. However, we do have some plans to bring as much of Pixelmator Photo as an extension as we can. Hope that explains things! Requires iOS 11.0 or later. Compatible with 12.9-inch iPad Pro, 12.9-inch iPad Pro Wi-Fi + Cellular, 9.7-inch iPad Pro, 9.7-inch iPad Pro Wi-Fi + Cellular, iPad (5th generation), iPad Wi-Fi + Cellular (5th generation), 12.9-inch iPad Pro (2nd generation), 12.9-inch iPad Pro Wi‑Fi + Cellular (2nd generation), 10.5-inch iPad Pro, 10.5-inch iPad Pro Wi‑Fi + Cellular, iPad (6th generation), iPad Wi-Fi + Cellular (6th generation), iPad Pro (11-inch), iPad Pro (11-inch) Wi-Fi + Cellular, iPad Pro (12.9-inch) (3rd generation), iPad Pro (12.9-inch) (3rd generation) Wi-Fi + Cellular, iPad mini (5th generation), iPad mini (5th generation) Wi-Fi + Cellular, iPad Air (3rd generation), and iPad Air (3rd generation) Wi-Fi + Cellular.